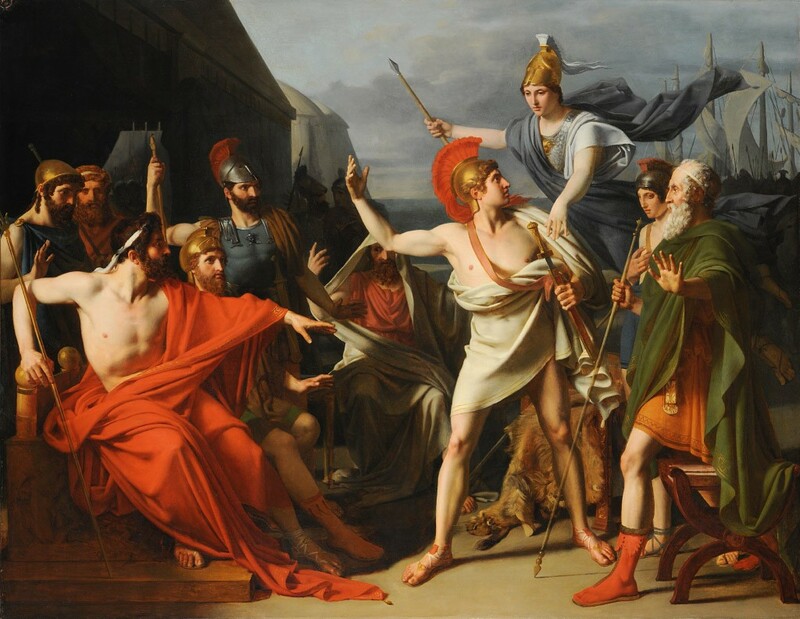 Michel-Martin Drolling, The Wrath of Achilles, 1810, Oil on canvas, 44 1/2 x 57 1/2 in., École des Beaux-Arts, Paris (PRP 48), Courtesy American Federation of Arts. 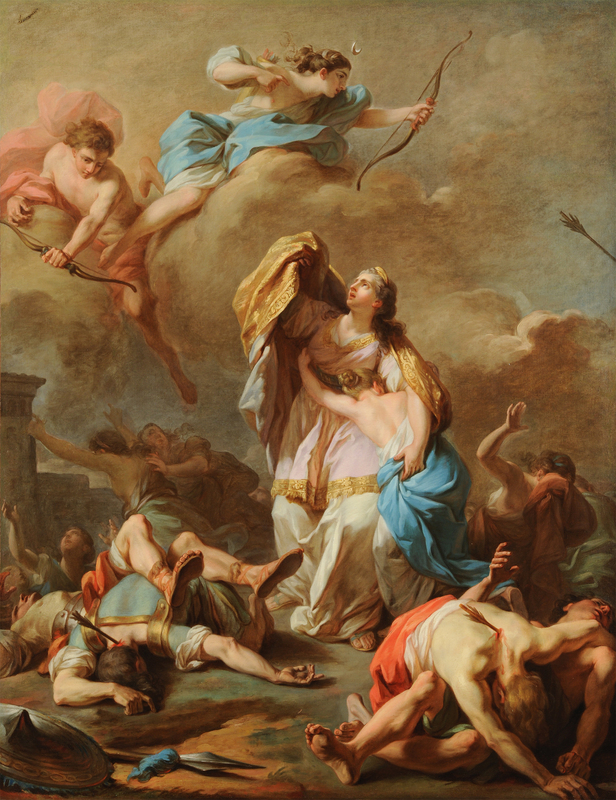 Pierre-Charles Jombert, Apollo and Diana Killing the Children of Niobe, 1772, Oil on canvas, 53 3/16 x 44 1/8 in., École des Beaux-Arts, Paris (PRP 17), Courtesy American Federation of Arts. This rich overview of masterpieces from the École des Beaux-Arts—the original school of fine arts in Paris and a repository for work by Europe’s most renowned artists since the seventeenth century—includes approximately 140 paintings, sculptures, and works on paper dating from antiquity through the nineteenth century. The exhibition focuses on epic themes such as courage, sacrifice, and death, as well as the ways that changing political and philosophical systems affected the choice and execution of these subjects. Among the featured works are paintings by Jacques-Louis David, Jean-Honoré Fragonard, Anne-Louis Girodet, and Jean-Auguste-Dominique Ingres; sculpture by Antoine-Louis Barye, Jean-Baptiste Carpeaux, Jean-Antoine Houdon, and François Rude; and drawings by Simon Vouet, Antoine-Jean Gros, and Théodore Géricault. Gods and Heroes offers unique insight into the development of an aesthetic ideology that fostered some of western art’s most magnificent achievements. The epic deeds of gods and heroes, enshrined in the Bible and the works of Homer, were the primary narratives from which both aspiring and established academicians drew their inspiration. At the École, learning how to construct persuasive and powerful paintings from carefully delineated anatomy, expressive faces, and convincing architectural and landscape settings was understood to be the route to success and recognition. The ideology was rooted in the study of the idealized human form as envisioned in classical art. The exhibition features extraordinary works that served as models for the students, including ancient sculpture, a drawing by Raphael, and prints by Albrecht Dürer and Rembrandt van Rijn. The exhibition is accompanied by a fully illustrated exhibition catalogue with a major essay by Guest Curator Emmanuel Schwartz, Conservateur du patrimoine/Research Curator at the École des Beaux-Arts, as well as several other major contributions. Gods and Heroes: Masterpieces from the École des Beaux-Arts, Paris is organized by the American Federation of Arts and the École des Beaux-Arts, Paris, and host curated by Dawson Carr, Ph.D., The Janet and Richard Geary Curator of European Art. PRESENTING SPONSOR: Gifts in Memory of Richard Geary and The Geary Foundation. LEAD SPONSOR: Laura S. Meier; Nani S. Warren / The Swigert Warren Foundation. MAJOR SPONSORS: William G. Gilmore Foundation; Walter Clay Hill and Family Foundation; The Harold and Arlene Schnitzer CARE Foundation; Arlene Schnitzer and Jordan Schnitzer. SPONSORS: Clark Foundation; Robert Lehman Foundation; Julie and Peter Stott; Total Wine & More. SUPPORTERS: Bruce Guenther and Eduardo A. Vides, M.D. ; Holzman Foundation; Dolorosa and David Margulis; Linda and Don Van Wart; Sabine and John Wild; The Wyss Foundation; Roudabeh and Mehdi Akhavein; European and American Art Council of the Portland Art Museum; The Acorn Fund of OCF; Carol Ann and Kent Caveny. Gods and Heroes: Masterpieces from the École des Beaux-Arts, Paris is organized by the American Federation of Arts and the École des Beaux-Arts, Paris. This exhibition is generously supported by an indemnity from the Federal Council on the Arts and the Humanities, the JFM Foundation, and Mrs. Donald M. Cox. Funding for the catalogue is provided by the Eugene V. and Clare E. Thaw Charitable Trust, the Stavros Niarchos Foundation, and the Samuel H. Kress Foundation. In-kind support is provided by Barbara and Richard S. Lane and Christie’s.